I recently bought tub of the face and body cream and it is magnificent! Soft, creamy and not oily, it left my skin smooth and soft. Now get this...my husband had an inflamed bug bite that had been there for a few months. He used some of this cream and it was noticeably improved the following day. Must be some of the natural ingredients. This product is a must! We received our products and we have been using it!!!! Her [my daughter] hair used to get really dry a lot but not anymore. I ordered 'Baby Naturals Face & Body Moisturiser' for my 1 yr old granddaughter and I have to say, we are highly impressed. I noticed a huge difference with my granddaughter’s skin after just one use. Beautiful Product. Soft bouncy curls without leaving that crunch on my 2c 3a combination curls on wash day. Great as refresher for 2-3 day curls. ...We love AfroShe products. I buy them religiously. Ruth is amazing and her customer service is exceptional! Customer for life! This hair gel is simply great! It's not sticky and doesn't leave white residue in my hair like other natural hair gels. I have very tight coily hair and this gel loosens and softens my coils. I will be buying this again! 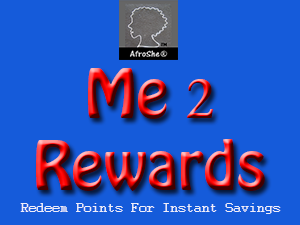 for AfroShe® news, special deals and offers!